All of the food on our menu was sourced directly from a local farmer or waterman. All of our spirits are from the US and their materials are thoughtfully sourced. All of our wines are organic, biodynamic or local, leaning towards the latter two. All of our beers are from farm breweries in Maryland. This commitment to source food from growers of the Chesapeake for its menu has expanded with the growing success of the restaurant’s Woodberry Pantry, a Maryland State approved canning facility, which creates products with the same commitment, as the restaurant, to Maryland farmers. The Pantry operation now supports a whole local economy of tomato growing and processing/canning in Baltimore, Maryland. Kudos for Spike Gjerde and the effort to develop new revenue sources for, in his words, our farmers. This consumer purchased on a recent visit to the Washington, DC area at Little Red Fox, a market and coffee shop (which serves up a delicious breakfast), a 20 oz. 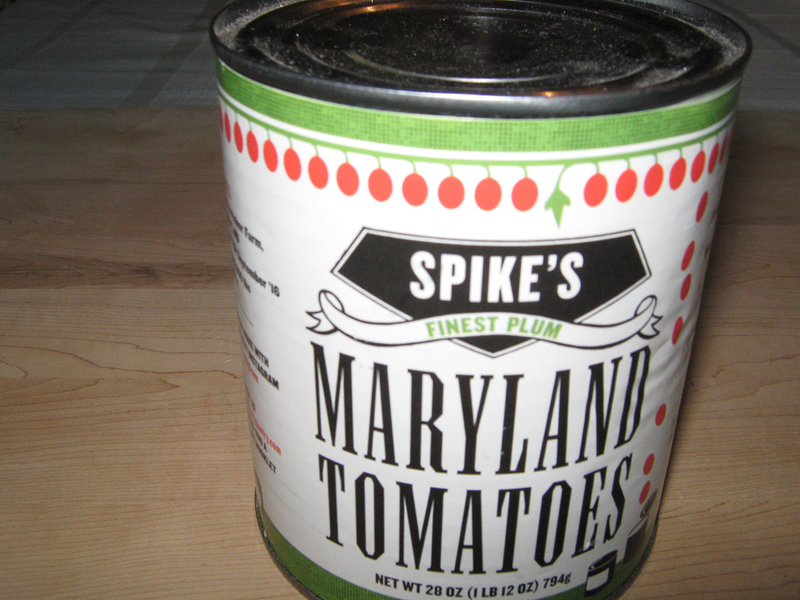 can of Spike’s Maryland Tomatoes which details these Farm Facts for the tomatoes in the can: Smithburg, Maryland’s Hawbaker Farm, Harvested September ’16; Yield: 240,000 lbs from 4 acres. Ingredients clearly noted: Plum Tomatoes, Salt. And these growing practices specified: no synthetic fertilizers, non-GMO seed, vine-ripened without ethylene glycol added. Plus, the can has non-BPA lining. On return home to upstate New York, some googling around for information on Hawbaker Farm did not disclose to what extent, if any, pesticides might be used in growing tomatoes on this farm near Smithsburg, Md. in Waynesboro, Pa. Yet a can of tomatoes with a state’s name proudly worn on its label, which demonstrates support for local agriculture and a small farm, and not some distant corporation focused on ever-increasing profits, is so unusual and praiseworthy, no regret for my purchase of Spike’s Maryland Tomatoes. But with tomatoes appearing #9 on The Dirty Dozen, the Environmental Working Group’s ranking of fruits and vegetables to avoid because of pesticide residue levels, this consumer is cautious when purchasing canned tomatoes, and fortunately, the Honest Weight Food Co-op in my hometown of Albany, NY offers canned organic tomatoes, albeit not canned Hudson Valley New York tomatoes, but certified organic, from afar: two brands of tomatoes from Italy, Bionaturae and Jovial, and Muir Glen’s from California. On its label, Bionaturae describes its tomatoes as grown on small family farms and naturally ripened in the Mediterranean sunshine. Jovial’s label notes its sweet & pure tomatoes are grown on small farms in Tuscany and packed on the very same day they are harvested. Muir Glen describes its tomatoes as grown on organic farms where they’re drenched in California sunshine. 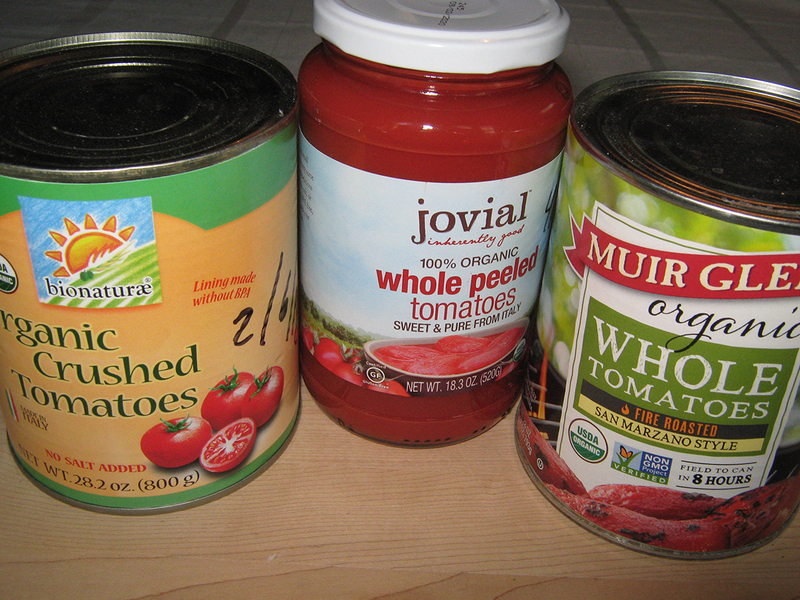 In this era when it’s wise to be skeptical about food labels, are these 3 brands of canned organic tomatoes really grown in soil? Vegetables grown in rich soil, full of micronutrients and microbial life, are superior (there are some 1030 microbes on Earth – that’s a nonillion of them, and rich soil contains abundant microbial life, not so with hydroponic agricultural practices). Bionaturae on its website notes that the sun, soil and tomato varieties provide the best tomatoes in the world. Jovial states on its website that our organic tomatoes are grown on just one organic, family farm in Italy, lovingly cared for during the hot summer months. No mention of soil but a review of the tab on Jovial’s website for Our Story and the concern for farming and tradition suggests that its tomatoes are rooted in rich soil. Muir Glen’s Field to Can in 8 hours slogan also suggest that its tomatoes are grown in soil and on its website where it describes Our Principles, the company emphasizes that Caring for the earth while growing great tomatoes is just part of what we do every day and illustrates these words with a farmer’s hand holding dirt. Inspirational and perhaps even approaching a little bit of magic, is to savor a fresh and organic tomato in early spring (especially after an extremely long winter in upstate New York) from a farm in even a colder climate zone than the Hudson Valley of upstate New York, and located nearly 150 miles northeast of Albany. This fresh tomato was one of very few in number, perhaps a dozen, spotted in the produce department of the Honest Weight Food Co-op in Albany. Let us praise Long Wind Farm (certified organic) in Thetford (Orange County), Vermont. Located in the northern reaches of the Connecticut River Valley, Long Wind Farm emphasizes that its certified organic tomatoes are grown in Vermont soil and taste like a tomato should (but seldom do). Our tomatoes taste so good because we select our varieties based on flavor rather than appearance. Then we grow them with tender love in rich soil (rather than the hydroponic way in a bag of coconut coir). The result is the best tomato you can buy. Best tomato you can buy? I buy that claim. 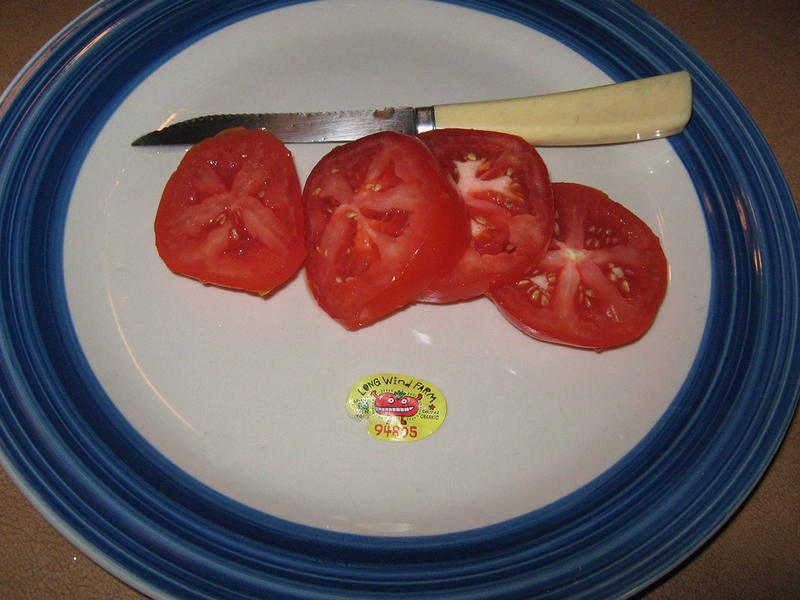 And the one tomato I savored in early spring cost $1.61, but worth every cent. Most of the “organic” fresh tomatoes now sold in the supermarkets of the Northeast are actually hydroponically grown, usually in Mexico and Canada, with all of the tomato’s nutrition derived from a liquid feed, much like an IV tube, as noted by Long Wind Farm on its website. In fact, most of the world (including Canada and Mexico) doesn’t allow hydroponic produce to be certified as organic, but in our United States they can be certified organic, as a result of a recent vote of the National Organic Standards Board. (Members of the NOSB voted 8 to 7 to reject a proposal that would disallow hydroponic and aquaponic farms from being certified organic.) Now the Keep the Soil in Organic movement is focusing on determining next steps and discussion focuses on creating a different label: Some want an add-on label that would stand for real organic. 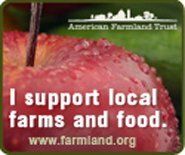 Some want a stand-alone label that has nothing to do with the National Organic Program. Some want to pursue the Regenerative Organic Label that Rodale is promoting. With tomato weather approaching, this backyard gardener has gotten an early start, setting out four organic tomato seedlings early in the growing season. The seedlings from Farm At Miller’s Crossing in Hudson (Columbia County, NY) are a range of varieties: Red Zebra (dark red fruit, gold streaked), Costoluto Genovese red paste type, Sun Gold cherry, and Lucky Tiger cherry, all for sale at the plant department of the Honest Weight Food Co-op. 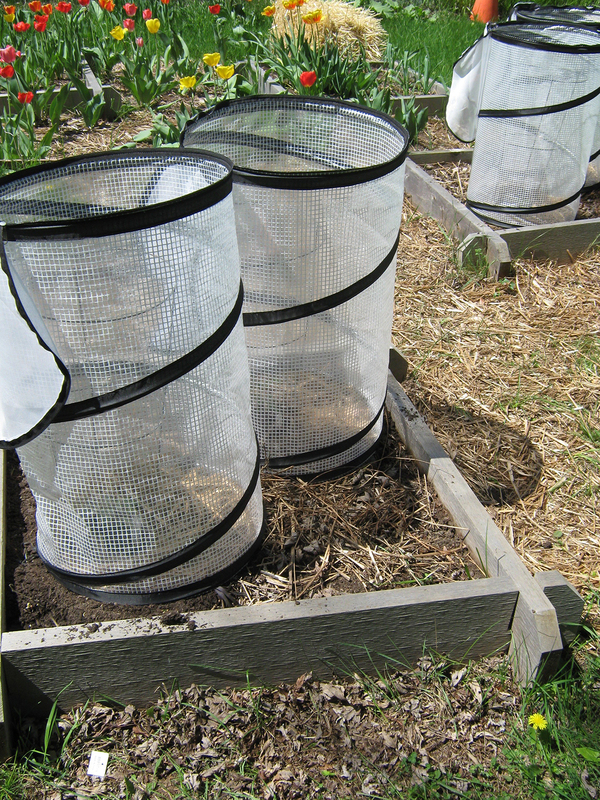 With nights still chilly, pop-up Tomato Accelerators (from Gardener’s Supply Company) get zipped up as the sun goes down in order to start the growing season early before hot tomato weather arrives. Here’s to summer’s bounty and fresh, organic tomatoes grown in rich soil!